I have to say that I’ve always been a tiny bit jealous seeing lots of other blogs get nominated for awards but finally my blog has one! Yay! 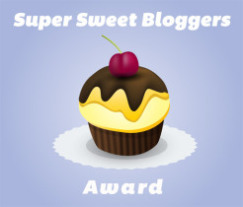 Thank you very much to All about the Bake for my nomination for the Super Sweet Blog award. The rules of the award are: 1 Visit and thank the blogger(s) who nominated you. 2 Acknowledge that blogger on your blog and link back. 3 Answer the “Super Sweet” questions. 4 Nominate a “Baker’s Dozen” (13) blogs for the award, add a link to their blogs in your post, and notify them on their blogs. 5Copy and paste the award on your blog somewhere. 1. Cookies or Cake? Cake. Yes, please! 3. What is your favorite sweet treat? Probably a bar of milk chocolate – anything from the cheapest to the most expensive. 4. When do you crave sweet things the most? In the evening when watching a film with my family.